The largest city in beautiful Umbria, vibrant Perugia is a delight for both gourmet tourists and culture vultures. There is a buzzing medieval center, wonderful art and monuments, and excellent restaurants & chocolate makers. There is also a youthful student atmosphere as Perugia hosts many International exchange students. Cosmopolitan and forward-thinking, especially when compared to the overwhelmingly rural region surrounding it, Perugia is an imminently walkable city whose history is visible at every turn. With its Etruscan ruins, Roman mosaics, medieval defense towers, and Renaissance palaces, Perugia is a living museum. Along with Bologna, Perugia is considered to have some of Italy’s happiest residents and there is an extremely high quality of life in this lovely town. A university city that draws students from across the globe, Perugia’s energy extends beyond its palazzos and museums to its streets and piazzas, which are dotted with cafés and full of energy. An abundance of city parks and gardens, some dating to the middle ages, provide pleasing interruptions of green amongst all the stones. Although the city had a tumultuous past, with seemingly endless invasions, wars, and strife with neighbors, the arts managed to thrive here; Perugia is one of Italy’s prime art centers, as a stroll through its galleries and churches will soon show. 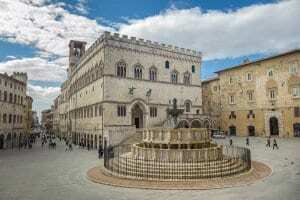 Today Perugia is a “must see” for those visiting Umbria, along with Orvieto, Spoleto, Assisi, and Gubbio. The city really comes alive during the fantastic Chocolate Festival every October and the jazz festival in July. As early as the 9th century BC settlers were making a life here. Later, the city became one of the major cities of the Etruscan Federation (a few remnants of that era survive; see Highlights, below). The fall to Rome, civil war and Byzantine rule followed, but by the 12th century, Perugia had declared itself an independent commune. This era saw the construction of some of its most important monuments, such as the Palazzo del Priori, the Fontana Maggiore and the university, but it led to continued strife, and in 1425 the city was enveloped into the Papal States. 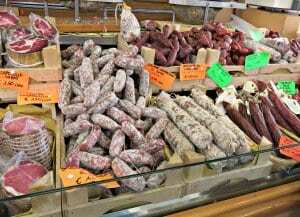 Black truffles and fragrant Olive Oil are found throughout Umbria and are popular buys in Perugia’s delicatessens. Other local specialties include dried pasta, chiuscolo (a tasty soft sausage) and Torta al Formaggio, or cheese bread, a delicious savory bread made with parmesan and typically served at Easter, although it’s made year-round. Another special bread is Torta al Testo, a flatbread originally eaten by peasants and now used for sandwiches. There’s a particularly strong tradition of sweets here. Near Easter, the ring-shaped Ciaramicola cakes appear in all the bakeries. Traditionally, girls give a cake (which is red and smothered in white icing) to their fiancé on Easter Sunday. At Christmas, everyone eats Pinoccate, dense cookies made with pine nuts and either chocolate or vanilla. Another traditional Christmas sweet, although now found year-round, is the coiled Torciglione, a dry almond cake made to look like a serpent. The wonderful Baci chocolates, now world famous, are made by the local brand Perugina. You can find wonderful Umbrian wines at all Perugia’s cafés and restaurants. The most common are Orvieto Classicos (a light white), Sangiovese-based reds, and Sagrantino di Montefalco’s (warm, weighty reds). Maker of the beloved Bacio (“Kisses”) chocolates and one of Italy’s most important chocolate manufacturers, has a museum looking back over its 100-year history. Chocoholics can also take a tour of the factory, with a reservation. The austere 14th-century Cathedral of San Lorenzo is famed as the home of the Virgin Mary’s wedding ring, a relic shown annually on July 30. Also interesting are the church’s two-tone façade (still unfinished) and the art and sculpture held here. This grand 13th-century fountain dominates the busy Piazza IV Novembre, Perugia’s main square. As it was in its heyday, this 13th-century palace is a showcase for all that’s bold and beautiful. The city’s best museums are located inside. Be sure to stop by the Galleria Nazionale dell’Umbria (National Gallery of Umbria), a gallery with works by local giants Perugino and Pinturicchio. This ancient civilization left its mark on Perugia, but few traces of it remain today. Among the most important ruins are the Arco Etrusco (Etruscan Arch) and the Pozzo Etrusco (Etruscan Well). Fans of ancient Italy will enjoy the ruins and artifacts in the elegant National Archeological Museum of Umbria. With a large collection of urns and some 200 tombs dating to the Hellenistic period, this vast Etruscan necropolis sheds light on ancient burial rituals. This tower, once a city gate in the wall that surrounded Perugia, was built in the 1200s and later fortified. Inside, a museum explores the city’s defense walls, and from the top, there are marvelous views over the city.